Digital collections marketing is an important, yet often ignored aspect of digital collection management. While many collections are laudable for the quality of their pictures, metadata, and preservation techniques, they often remain obscure, unknown, and therefore inaccessible to their intended user populations. One of the ways digital librarians can cultivate a broader awareness of their collections is through social networking. More importantly, digital librarians who participate in conversations with users through the use of social media become inextricably intertwined with the knowledge creation processes relevant to their collections. This paper presents a set of five general principles (listening, participation, transparency, policy, and strategy) that provide digital librarians with straightforward, concrete strategies for successfully integrating social media into a digital library's overall strategic plan. In addition to these concrete strategies, I also explain the theoretical importance of each principle and its relevance for establishing a rapport with current and potential users of a digital collection. In recent years, librarians have become increasingly aware that their digital collections are too often underutilized by their intended user base. For example, Erway & Schaffer (2007, pg. 7) charge that "our intricate attempts to describe and present a few choice collections have resulted in expensive, but little-used websites. And the rest of our collections remain largely invisible ... discovery happens elsewhere". Buczynski (2007, pg. 196) agrees: "there is an awareness gap between the holdings of digital libraries and the communities they serve". A 2005 survey conducted by OCLC supported this idea, showing that 58% of respondents did not know that their library held electronically accessible full-text materials (Buczynski, 2007). Additionally, 84% of respondents used a web-based search engine as their first choice for search versus only 1% who said they went to a library search engine first (ibid). This is confirmed by the fact that the literature on building digital collections is vast, while literature about how to market those collections is comparatively thin (Henderson, 2005). As a result, many digital collections suffer not only from a lack of general public awareness, but also from a lack of funding in response to their perceived unimportance (Erway & Schaffner, 2007 and Madsen, 2009). Madsen (2009, pg. 1) confirms that "there seems to be a disconnect when it comes to online collections, and often a 'build it and they will come' attitude prevails". Unfortunately, it seems that the typical assumption held by many brick and mortar libraries  that the success of a library rests on the quality of its physical materials (i.e., the collection) also applies to many, if not most, digital library collections as well. This model of librarianship leaves librarians at the periphery, puts collections in the center, and does not ascribe appropriate weight to the essential role librarians play in facilitating the usefulness of those collections through conversations and knowledge creation (Lankes, et al., 2007). This is especially true for digital librarians, who appear disembodied from their collections because they exist solely in the online environment. One of the best ways to promote a collection online therefore, would be for digital librarians to participate in relevant online conversations using social media tools such as blogging, Twitter, Facebook, and YouTube. Using social media not only allows digital librarians to advertise and encourage the use of their collections, it places the digital librarians back in the center as chief negotiators of the knowledge creation and education that occurs as a result of user-user and user-library interactions. Although some digital librarians are beginning to take advantage of online social networking tools in order to create online conversations about their digital holdings (e.g., see the Springer, et al., 2008, regarding the Library of Congress Flickr Commons project), many do not adequately think through the necessary requirements of doing so. Even worse, many often use social media as a way of blithely promoting their content instead of as a way to establish trusted relationships with users. As such, the goal of this paper is to provide digital librarians with a simple framework for implementing a social networking plan in the digital library context. In what follows, I present a set of five general principles (listening, participation, transparency, policy, and strategy) that provide the digital librarian with straightforward, concrete strategies for successfully integrating social media into a digital library's overall strategic plan. In addition to these concrete strategies, I also explain the theoretical importance of each principle and its relevance for establishing a rapport with current or potential users of a digital collection. As digital librarians, we want to meet our users where they are. But where are they? The first step toward developing a successful social media program is to find out where the conversations are happening and begin listening to the things people are saying. This first principle is especially important because the ease of setting up a social media account for the library, and immediately putting it to use, often obscures the greater need for the librarian to first identify topics that will be relevant to conversations already taking place in the online environment. Listening also allows the librarian to identify those people who are particularly central to those conversations and engage with them. It is not enough to simply create a social media account and start talking about all the great things the digital library does. Updates to the library social media page must be carefully targeted both in terms of the content (i.e., it should have relevance to pre-existing conversations) and in terms of the people who will see the update (i.e., those people in the online space who demonstrate a passion for the subject). While each social media site may require a different strategy, there are some general strategies a digital librarian can implement in order to begin listening. Google Alerts is a Google feature that informs users when the Google search engine indexes web pages with search terms that have been specified by the user. To use it, go to the Google Alerts website and enter in relevant search queries for your digital collections. Take the Peace and War in the 20th Century collection by McMaster University of Ontario, for example. If they wanted to know more about online conversations relevant to one of their collections, let's say the British Military Forces in the Middle East collection, they could put those search terms into Google Alerts and be notified via RSS or email every time a new page with those terms was indexed. During a recent project with the Jewish Federation of Central New York, we followed a feed for the query "Syracuse Jewish". Figure 1 illustrates what the feed looked like in Google Reader. Figure 1: Google Alert for Google query "Syracuse Jewish". Google Alerts is not the only place to listen. Using Twitter Search (a site that allows you to search for Tweets and user updates that contain the search terms specified by the user) to query "British Military" and "war" would give the librarians at McMaster a sense of what people were saying about a subject related to their collection. While none of the Tweets seem to be specifically related to the British Military actions in the Middle East, there are a couple references to the British Military and its war actions in the 20th century. Tweets with those search terms may still be relevant for the librarian to watch and will give her/him a better sense of the kinds of topics that people are currently discussing. Once a relevant feed is discovered, the library can click on the RSS feed link (see Figure 2 below) and follow that feed to keep abreast of new content containing those search terms. The same is true of sites like Delicious (a site where users place their online bookmarks); Technorati (a site where people vote up their favorite blogposts); and Google's BlogSearch (a place to search for blogposts relevant to the digital library's specific subject). RSS feeds for searches related to peace and war in the 20th century in any or all of these places would allow the library to acquire a better understanding of where peoples' interests lay and how the library's digital holdings might play a role in facilitating conversations about those interests. 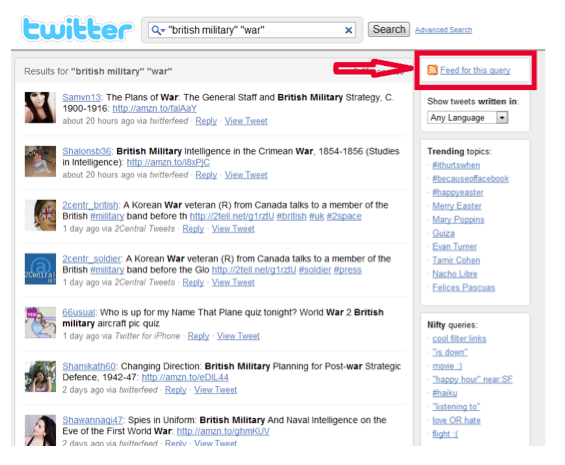 Figure 2: Search in TwitterSearch for "British Military" and "war". Listening can also help librarians to become better acquainted with the language and cultural norms used in social media interactions. It can be difficult not to sound stiff when one is unfamiliar with how people interact through social media sites. Following feeds and watching as a silent participant acculturates the listener to the appropriate kinds of interactions and discussions for his/her particular subject area. One important benefit that social networking provides to digital librarians is that it allows them to put a human face on their collection. Many librarians think that using social media is a good way to "get their library's name out there." These so-called brand evangelists do not accomplish much besides showing their customers that they are egotistic, interested only in promoting the things that the library thinks are worthwhile (Brogan & Smith, 2009). Additionally, it happens all too often that users reach out to talk to a library and receive no response because the library did not invest the required effort into monitoring their social media pages. A library that talks only to itself and about itself fails to provide users with a valuable service and reinforces the idea that users do not matter enough to warrant engaging in a discussion with them. A good social media program, on the other hand, allows the digital librarian to establish trust with users. The library does not prove its authoritativeness solely through the quality of its holdings; it must also prove it through the quality of the librarians' interactions with users. It's surprising therefore, that the majority of digital libraries seem to contain no more than a single way of contacting the librarians associated with their collections, usually through the Contact Us page on their website. Even the oft-cited OCLC paper Trusted Digital Repositories makes little or no mention of developing trust through relationships and conversations with users (Research Libraries Group, 2002). Participation in conversations through social media not only bolsters awareness of a digital library program, but also provides evidence that the curators of that collection are knowledgeable and capable of providing dependable information to their users. Although participation in conversations with users (or potential users) through social media can serve as a way of promoting a digital library's collection, it should be noted that this cannot be, and should not be, the aim of social media conversations. Developing trust means answering people's questions out of a desire to help, not a desire to promote the library. Fine & Kanter (2010, pg. 95) sum this up well in The Networked Nonprofit: "...building a network of supporters who will help some time in the future in myriad and unexpected ways means spending time in conversations that may not have any immediate outcomes". Establishing the digital library as an important participant in the knowledge community not only heightens the level of trustworthiness of the collection, it also builds a base of dedicated users that are able to talk to each other. This can be especially useful when convincing stakeholders of the value of a digital collection and its impact on users. If done properly, the library's social media contacts will likely come to their aid in a time of need, whether that be through funding, advocacy, or some other method of support. Post comments on relevant blogs. Follow people on Twitter and retweet valuable content. Promote others, not yourself (Brogan & Smith, 2009). Use Facebook/Twitter to post pertinent information about the digital collection only when it becomes clear from listening to conversations that the resource will be useful to users. Write a blog about the collection. Highlight aspects of the collection that will be particularly useful given the knowledge-community's interests that you've identified through listening, but make sure to talk about what others are doing as well. Use word of mouth to share your excitement about the digital collections offline, at conferences for example, and in other places. Invite people to become part of the conversation online. Allow people to ask questions through Facebook and Twitter and make sure to respond promptly. One of the aspects of social media that frightens people most is its perceived ability to give the library bad press. The librarian is afraid of losing control over the library's public image and does not want to acknowledge the fact that it may be failing in its mission. But this attitude, rooted in the public relations paradigms of previous decades, assumes that such exposure is inherently harmful. To the contrary, many organizations now find that as they open up their business processes and their budgets to public scrutiny, they receive more support, not less. At minimum, it positively reinforces the trusted relationships developed with users. At best, opening up the library to public scrutiny allows users to offer their insight and ideas about how to improve the collection by making it more efficient and user friendly. For an example of this, take a look at Perseus Digital Library's Facebook page, where some of the most recent comments are about the website not working properly. Figure 3: Digital Library Response to Criticism. Many librarians cringe at the thought that the first thing a user will see when he or she visits the digital library's Facebook page is criticism of the library. However, as you can see above, the library's prompt response and subsequent short conversation shows users the exact opposite, namely, that the library cares about its users and will go out of its way to ensure that they get the services they need. Many institutions suffer from lack of follow through when it comes to creating a social networking presence. Creating an account on a social media site is so simple and novel that it often obscures the reality of having to tend to the account daily in order to reap any benefits from it. For this reason, the capital and labor requirements for implementing a social media plan need to be included in the larger marketing and strategic plans. In fact, any new program or service that a library wants to implement requires developing a plan for integrating new business processes into its current work flows, marketing the program, and assessing it. Attempting to create a social networking program for a digital library without forethought is like uploading a new catalog record with only one category of metadata: the record exists but it's not very useful, nor is it likely to be found. If digital libraries truly want to create a lasting and rewarding social media program, they need to think ahead about who will be responsible for creating content, maintaining the site, and responding to users when necessary. Digital librarians stand to gain a lot from engaging their users in conversations through the use of social media. Since digital librarians typically direct their energy toward the more traditional aspects of managing digital collections (e.g., curation, preservation, acquisitions, cataloging), they often lose sight of a fundamental concept of building a successful digital collection, namely, that the collection is only a means to an end. Specifically, that "end" is the knowledge creation and ideating that occurs through conversations facilitated by the librarian. When done properly, a social networking program provides a way for digital librarians to develop rapport with users, extend general awareness of the digital collection, and establish the librarian as a knowledgeable, helpful, and easily accessible source of authoritative information regarding a given subject area. When done poorly, however, it reinforces the idea that the library is disconnected from the most important conversations and discussions and contains little of relevance to the vast majority of potential users. Funders may trim a collection's budget when they see a lack of real impact on users. When social networking, or some sort of marketing, is not engaged in at all the library risks becoming isolated and needing to rely upon the good will and interest of a chosen few to ensure its continued existence. By drawing on the concepts and concrete strategies described in the five principles above, digital librarians will be able to implement a successful social media program, and ultimately prove the value of their collections by establishing themselves as essential participants in relevant knowledge-creating conversations. Brogan, C. & Smith, J. (2009). Trust Agents. Hobeken, NJ: John Wiley & Sons. Buczynski, J. (2007). Referral Marketing Campaigns: "Slashdotting" Electronic Resources. The Serials Librarian Serials Librarian, 53/(3), 193-209. Retrieved on June 28, 2011 from http://www.tandfonline.com/doi/abs/10.1300/J123v53n03_13?journalCode=wser20. Erway, R. & Schaffner, J. (2007). Shifting gears: gearing up to get in the flow. OCLC Programs and Research. Retrieved from Blackboard ILMS, https://ilms.syr.edu/webct/urw/lc9140001.tp0/cobaltMainFrame.dowebct on January 24, 2011. Fine, A., Kanter, B (2010). The Networked Nonprofit: Connecting with social media to drive change. San Francisco, CA: John Wiley and Sons. Henderson, K. (2005). Marketing strategies for digital library services: digital directions. Library Review, 54 (6), 342. doi:10.1108/00242530510605467. Howard, J (Feb 20, 2011). Social Media Lure Academics Frustrated by Journals. The Chronicle of Higher Education (Technology). http://chronicle.com/article/Social-Media-Lure-Academics/126426/. Retrieved on April 24, 2011. Lankes, R.D., Silverstein, J., Nicholson, S., & Marshall, T. (2007) Participatory networks: The library as conversation. Information Research. Retrieved on February 13, 2011 from http://quartz.syr.edu/rdlankes/Publications/Journals/COLISFinal-v7.pdf. Madsen, C. M. (2009). The importance of 'marketing' digital collections: Including a case study from Harvard's open collections program. ALISS Quarterly, 5(1), 2-9. http://www.alissnet.org.uk/uploadedFiles/Aliss_Quarterly/completeproofoct2009.pdf. Research Libraries Group (2002). Trusted Digital Repositories: Attributes and Responsibilities. http://www.oclc.org/research/activities/past/rlg/trustedrep/repositories.pdf. Retrieved on April 24, 2011. Schrier, R (2011). Your mother is watching: develop your social media policy accordingly. Retrieved on April 28, 2011 from http://schriroist511.blogspot.com/2011/04/youre-mother-is-watching-develop-your.html. Solomon, L. (2011). Doing social media so it matters: A librarian's guide. Chicago: American Library Association. Springer, M., Dulabahn, B., Michel, P., Natanson, B., Reser, D., Woodward, D., & Zinkham, H. (2008). For the Common Good: The Library of Congress Flickr Pilot Project. Retrieved On March 17, 2011 from http://www.LC.gov/rr/print/flickr_report_final.pdf. Starr, J. (2010). California Digital Library in Twitter-land. Computers in Libraries, 30(7), 23-27. http://www.infotoday.com/cilmag/sep10/index.shtml. Robert Schrier is currently finishing his MLSIS at Syracuse University after working the last two years as a librarian at Plymouth Regional High School. He now works as a one of a group of researchers for the Public Safety Network Study exploring fuzzy set logic applications to survey data. Most recently, he has begun writing software specifications as a product analyst intern for Polaris Library Systems in Liverpool.